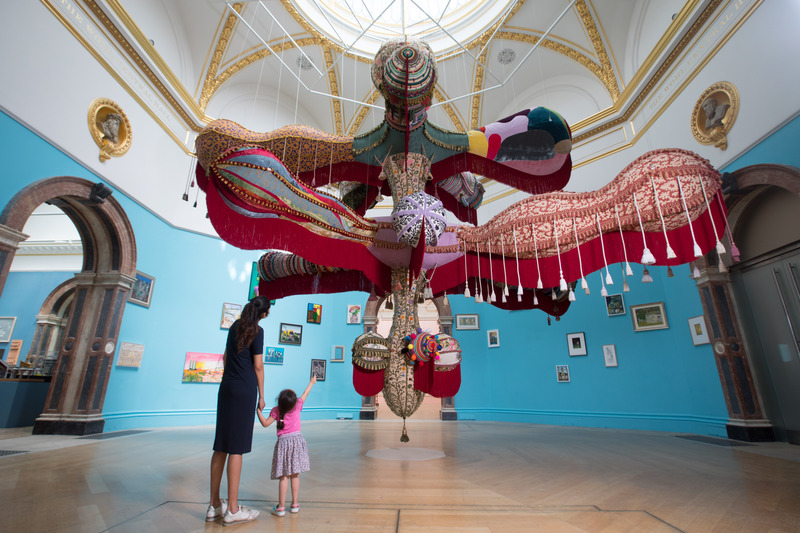 On arrival visitors are greeted by a large, velvet sculpture by Portuguese artist, Joana Vasconcelos, famed for A Novia, a 20 ft. high chandelier made out of over 25,000 OB tampons. From the outset, its clear this exhibition is about contrasts. In the same way Vasconcelos’ huge red sculpture is framed by a fluorescent blue backdrop, celebrated greats by David Hockney hang amongst lesser-known amateur artists. As we stroll into gallery III, visitors are at once struck by a vibrant, sunny yellow wall embellished with paintings hung in a rather disorderly fashion. The largely colourful and bright pieces clash with the blazing yellow behind them. On closer inspection, the political messages inside the pieces are just as assertive as the vibrant decoration. 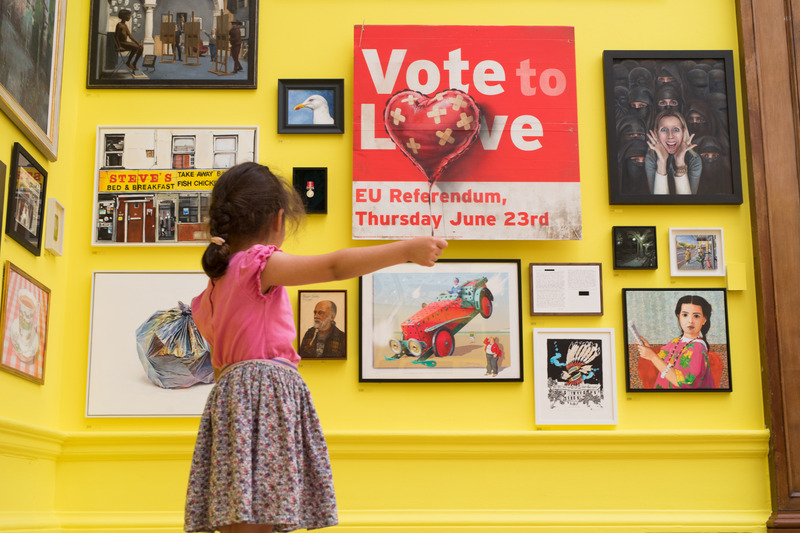 For example, Banksy’s new work – ‘Vote to love’ was ironically fashioned from a UKIP poster. Near, a piece by Alison Jackson, imagines a world in which ‘Trump and Miss Mexico’ finally meet in the Oval Office. Dotted around are portrait’s of Jacob Rees-Mogg (Paul Selley) and Nigel Farage (David Griffiths). Despite the clear political message Perry’s wit shines through, making the room appear more light-hearted with paintings such as ‘Rich People Smell Funny’ and the afformented Nigel Farage portrait hanging directly below an image of a man vomiting. The contrast continues as we move further into the exhibition. A large carbon pencil work, Science Without Religion is Lame, Religion Without Science is Blind, by Beatrice Haines, encapsulates perfectly the oft quoted words of Albert Einstein. As Stephen Hawking reaches towards the clutch of Sister Hannah Benedictus, viewers are reminded of The Creation of Adam. An exceptionally bold artistic statement from Haines, to imagine notable atheist Hawking as a modern day God; made now. 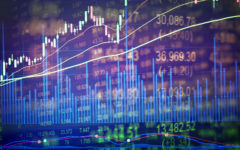 More analytical inspection perhaps suggests otherwise, as the fragility of both parties creates a sense of weakness in this relationship. The newly opened Ronald and Rita McAulay Gallery showcases works identified by the committee as being particularly amusing. As we enter the exhibition, a tat-filled shopping trolley forcefully orders viewers to ‘save cash’. 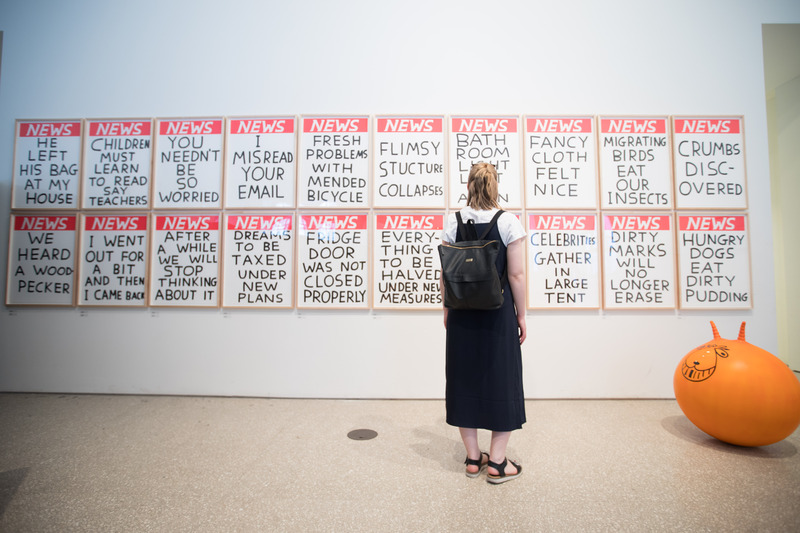 Behind it hangs David Shrigley’s twenty ‘front pages’; a wall of parody newspaper headlines. The titles range from the mundane ‘fridge door was not closed properly’ to ‘dreams to be taxed under new plans’. What remains clear was Shirgly’s desire to express an unsavoury feeling towards the over-saturation of the media. Although this gallery could be seen as a room of fun, it was clear all the pieces are darkly comical. Martin Parr’s photographical documentation of ‘selfie-taking’ in India, pinpoints the 21st century fascination of ‘being’ yet not really ‘seeing’. 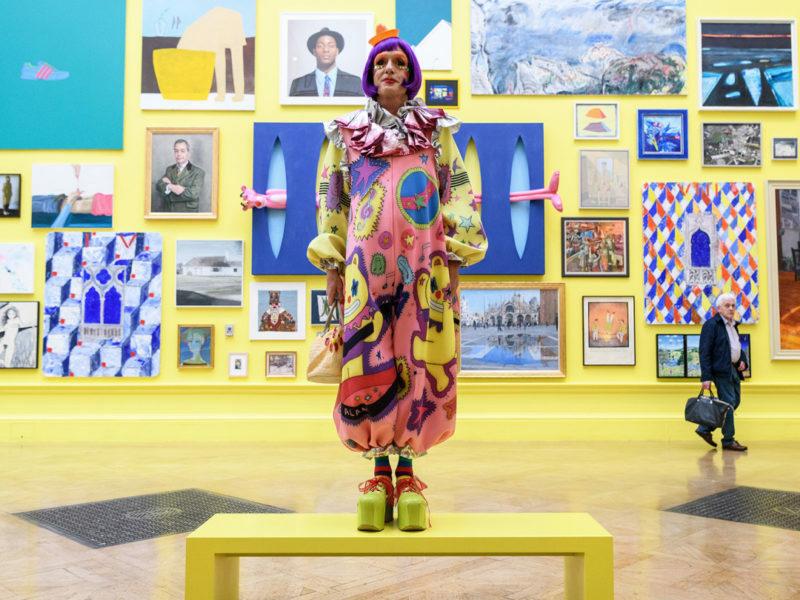 On closer reflection the gallery turns from a light-hearted and comical place, to perhaps the room in the exhibition that requires the deepest and most uncomfortable reflection on today’s society. Leaving the exhibition I noticed as I strolled through London’s West End the exhibition did not stop inside. 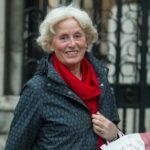 Rather Royal Academians Rosie Wylie, Grayson Perry, Joe Tilson and Cornelia Parker have decorated the streets with over 200 flags meaning the exhibition stays with you even after you leave. Perhaps what is most profound about Perry’s exhibition is not the disordered hangings or the political undertones. Its that this is Art Made Now. The great masterpieces of the past have shown Gods and Goddesses, valiant war scenes, breath taking scenery, which all make today’s ‘selfie’-taking and commuter scrambling all seem rather trivial, an embarrassing depiction of what we have allowed life to become. While it is true that art most capture both the real and the unreal; Perry’s exhibition offers a profoundly pessimistic portrayal of 21st century life. Saudi 2.0: Can the kingdom really be remade?